Summer is a time for relaxation, sunshine, and getting out of the house to do all of the things it was too cold to do all winter. But, there will be days when the summer weather is too extreme to truly enjoy: when the heat and humidity make it uncomfortable outside and you stay in. 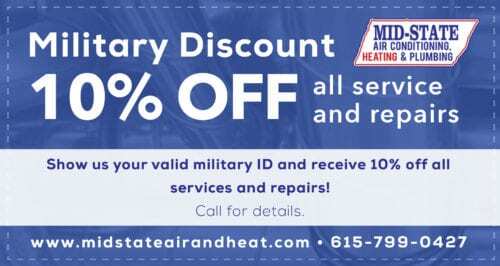 That is when you need a good air conditioning system and a company like Mid–State Air Conditioning, Heating & Plumbing to install, maintain and repair it for you. 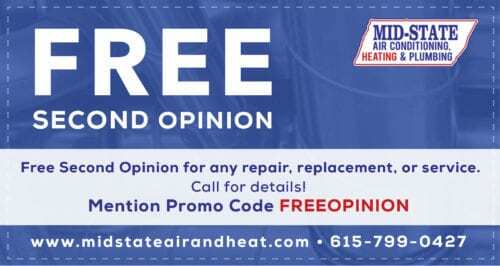 Contact us today for all your air conditioning needs in Nashville, TN, Franklin, TN and the Middle Tennessee area. The first step in choosing a new air conditioning system is to ensure it is properly sized to match the specific needs of your home. We can visit your house and perform a thorough load calculation to determine the exact amount of cooling required to keep it comfortable on a typical summer day. Using this measurement, we will help you select an air conditioner that fits not only your cooling needs, but your budget. Other factors we take into consideration include the size of your home, the number of rooms that need to be cooled, the state of your existing air handler and ventilation system, and what kind of insulation and weather stripping you currently have. When it comes time to replace your existing air conditioning system, we will make sure that you save as much money as possible, not only on the installation process but on your ongoing operating costs. Often, upgrading your air conditioner can save you a significant amount of money per year on the electricity used to cool your home. It also greatly reduces the amount of money spent on repairs and maintenance. 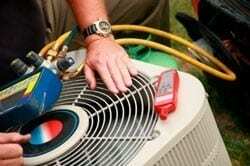 For those with existing air conditioning systems, we highly recommend annual maintenance. A tune–up will ensure that your system operates at peak efficiency and it also minimizes the number of repairs necessary throughout the life of the system. It also extends the lifespan of most air conditioning systems and avoids premature replacement. If a problem should develop, we have technicians on call 7 days a week to perform emergency repairs. Just give us a call to learn more about our full range of air conditioning repair and maintenance services in the region. 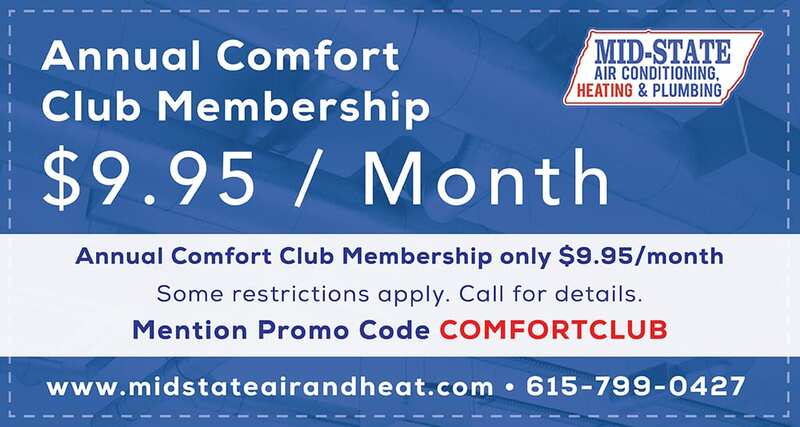 Wherever you live in the greater Nashville, TN area, contact the experts of Mid–State Air Conditioning, Heating & Plumbing today to learn more about all of our air conditioning services. 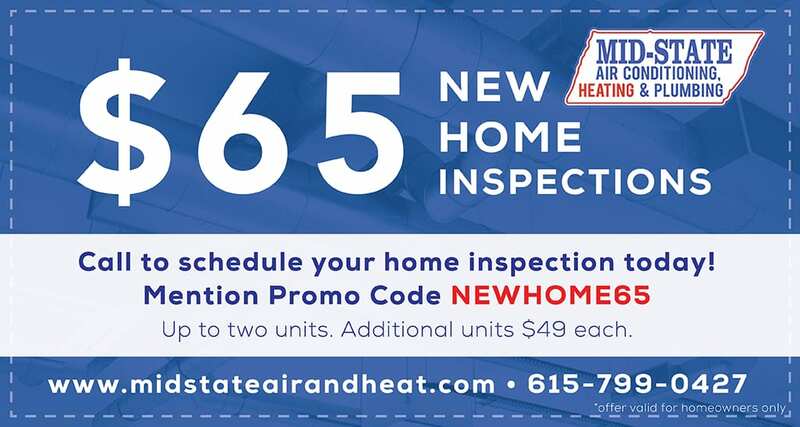 Whether you need an entirely new system installed in your Middle Tennessee home or you simply need a professional to perform a thorough inspection of your existing system as part of regular maintenance, contact us today to learn what we can do for you.